The twin of a kindly small-town physician returns from the grave for vengeance against his brother, who secretly killed him because the twin served Satan. A group of teens are stalked and killed by a Shaman at a cursed camping site. Sir Joel Cadman, a mad scientist, kidnaps his victims and cuts open their brains in an effort to discover a means to cure his wife's brain tumor. Stars: Basil Rathbone, Akim Tamiroff, Lon Chaney Jr. The stripper Jeanette Moreneau (Susanne Loret) is dumped by her boyfriend Pierre Mornet (Sergio Fantoni) and she drives her car to talk to him. However, she has a car accident and the left side of her face is completely disfigured by horrible scars. She is approached in the hospital by Monique Riviere (Franca Parisi), who is the assistant and lover of Professor Alberto Levin (Alberto Lupo), and she tells Jeanette that her face can be restored. Jeanette secretly goes to the professor's house and is treated by him, using a process that depends on the cells that Prof. Levin, who is also a monster that strangles his victim, removes from the women that he kills. While treating Jeanette, Prof. Levin falls in an unrequited love for her and kills Monique. Meanwhile, the police inspector that is investigating the mysterious murders, suspects of Prof. Levin. "Seddok, l'Erede di Satana" (meaning "Seddok, the Heir of Satan"), a.k.a. 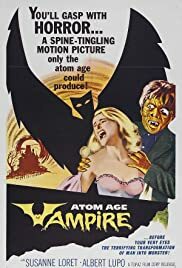 "Atom Age Vampire", is a trash Italian horror film that combines "Dr. Jekyll and Mr. Hyde" with Georges Franju's "Les Yeux Sans Visage" and the vampire of the messy American title. The result is a predictable film, with one actress that recalls Sophia Loren and the other that recalls Madonna. But anyway, it is entertaining and worths be watched. I saw the 87 minutes version and by the way, who is Seddok? My vote is five.